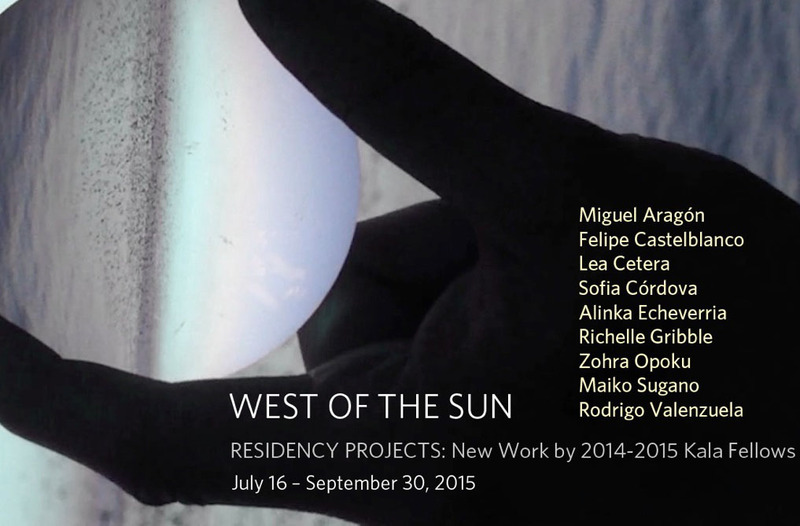 Kala Gallery is proud to present West of the Sun, featuring new work by 2014-2015 Kala Fellowship artists. The exhibition includes Miguel Aragón, Felipe Castelblanco, Lea Cetera, Sofia Córdova, Alinka Echeverria, Richelle Gribble, Zohra Opoku, Maiko Sugano and Rodrigo Valenzuela. Kala Fellowships are awarded annually to a group of innovative artists working in printmaking, photography, book arts, installation, video and digital media. Fellowship artists are selected from a competitive field of applicants from around the globe. The 2014-2015 Fellowship artists were selected by a Kala Selection Committee and two guest jurors: Xiaoyu Weng, Curator, Writer, and Director of Asian Programs for the Kadist Art Foundation and Asian Contemporary Arts Consortium in San Francisco, and Ranu Mukherjee, artist and alumni of the Kala Fellowship program. Artists create their artwork in pursuit of personal research. In the process of creation, some look for answers or solutions to socio-political concerns; others reflect on other issues and ask questions to the audience engaging them with issues familiar or unfamiliar. In the exhibition West of the Sun, nine diverse artists search for their unique voice to examine specific cultural agendas. Each artist voice reflects a different cultural background and investigates issues that impact their everyday lives. During his residency at Kala, Miguel A. Aragón created a series of toned cyanotype based on photographs published by the media regarding the Mexican Drug Cartel Wars in Ciudad Juárez, his native city. By using metaphors and visual metonymies to tie together process and subject matter, Miguel explores the idea of perception, memory and transformation. His work is derived from a need to find meaning in these brutal events that repositions the corpse in our field of vision, reminding us that our physical existence is finite. Aragón was born and raised in Ciudad Juárez, México. His work has been exhibited nationally and internationally in venues such as the International Print Center New York, Intersection for the Arts in San Francisco CA, OSDE Espacio de Arte in Argentina, Austin Museum of Art, Mexic-Arte Museum, and more. He is currently an Assistant Professor in Printmaking at the College of Staten Island NY. Felipe Castelblanco presents Notre es Sur / Sur Is North,a book project and related video for this exhibition. Notre es Sur / Sur Is North is made in collaboration with participants from around the world. It reinterprets the traditional geography featuring over 30 cities both in the Northern and Southern hemispheres. He completed the book in 2015 and split it half separating the North and the South. The North section is presented in Kala gallery in Berkeleu, California and the South section is on view across the globe in the exhibition We Out Here at Royal Academy Schools, London. Felipe holds his MFA from Carnegie Mellon University. His work has been shown internationally, including the San Diego Museum of Art; FAD festival in Belo Horizonte, Brazil; FIVAC festival in Camaguey Cuba; the Valenzuela Klenner Gallery in Bogotá Colombia. He is a recipient of the 2014 Starr Fellowship at the Royal Academy in London; and is currently developing a participatory project in the Philippines, through the American Arts Incubator exchange program, a commission by the US Department of Education and Zero1. Lea Cetera was in residence in Kala’s Artist Project Space in May and June. While in residence, she worked on a public participatory video project in collaboration with gallery visitors. Exploring unrestricted open-ended parameters, Lea created an exquisite corpse video combining excerpts of prepared dialogue performed by participants. After collecting the scenes, Lea reconfigured the clips in order to create a new narrative that neither the performers nor director could anticipate. Like any exquisite corpse, there is no true sense of the outcome until the end. Lea has shown her work internationally at venues such as Sculpture Center, The Jewish Museum, Disjecta Contemporary Art Center, Portland; Pilar Corrias London; Southard Reid, London; Simone Subal, High Desert Test Sites, Joshua Tree; Anthology Film Archives and more. She holds an MFA from Columbia University, 2012 and a BFA from the Cooper Union School of Art, 2005. Sofía Córdova works in media ranging from video to painting to photography to describe the future of our dying earth. These works are meant to exist 1000 years in the future and reflect back on our changing planet. They are not an archive in the traditional sense but a deeply subjective interpretation of ‘ancient’ documents based on materials gathered contemporaneously. Together, these objects reveal a narrative, which can only be inferred from the aggregate of the altered pieces. Each sub-body of work is designed to stand alone and reveal a specific aspect of the future. Born in Carolina, Puerto Rico, Sofía received her BFA from St. John’s University and her MFA from the California College of the Arts. She also completed the one-year certificate program at the International Center for Photography in New York. She has performed at SFMOMA, SomaArts and Galeria De La Raza among others. Her work has been exhibited at the Sonoma Valley Museum of Art, AMOA/Art House, Southern Exposure, Queen’s Nails, The International Center of Photography as well as other venues internationally. Her work is part of Pier 24’s permanent collection. Referring to her personal history and Mexican-British heritage as well as other people’s stories that she encounters through her projects, Alinka Echeverria’s work explores how our cultural perspective influences the viewing of certain political phenomenon. For West of the Sun, Alinkapresents her most recent project M-Theory, metaphorical interpretation of South Africa’s struggle against Apartheid. Using magnified fingerprints of prominent figures such as Nelson Mandela and Deputy Chief Justice Moseneke, as well as lesser-known struggle fighters, she looks at details and determining factors within a system of racial op­pression. Alinka received the HSBC Prize for Photography in 2011 and has been nominated for the Paul Huf and Prix Pictet Awards. Her work has been widely exhibited at international venues, including Maison European de la Photographie in Paris, the National Portrait Gallery in London, The California Museum of Photography and the Moscow Photobiennale. She earned her MA in Social Anthropology at the University of Edinburgh prior to studying photography at the International Center of Photography in New York. 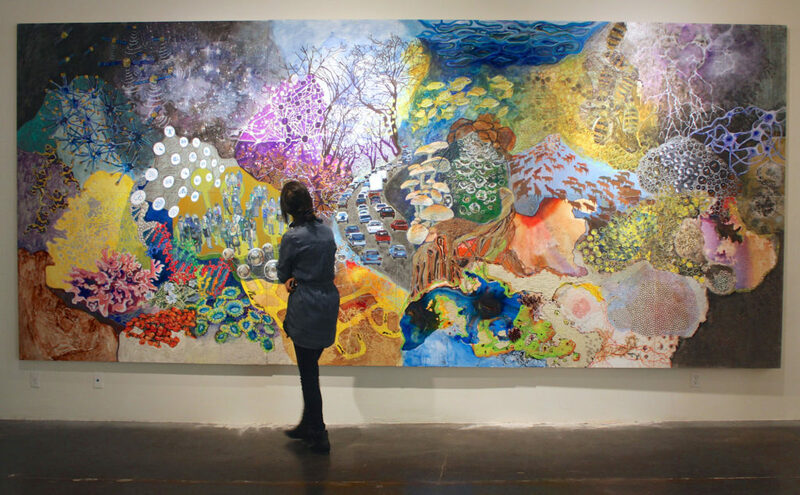 Richelle Gribble’s Overview, a large-scale mixed media painting features an array of networks such as molecular structures, social networks, and celestial systems. Inspired by Frank White’s idea of the Overview Effect, Richelle’s painting evokes the awareness of our interconnectivity within the elements on our globe. Her painting explores a new way to connect with each other reflecting our mobilized and connected society, and asks the viewers to reconsider their roles within it. Richelle received a BFA with dual minors in Social Entrepreneurship and Marketing from the University of Southern California. Her work has been presented in numerous exhibitions including Helen Lindhurst Gallery, LA, the International Print Center New York’s New Prints/Summer 2014 exhibition at IPCNY Gallery and Christie’s in Rockefeller Center salesroom. Her artwork was displayed on a LED screen in Times Square as a finalist in the competition Art Takes Times Square. She is a recipient of awards including the Kala Fellowship Award and the Discovery Scholar Prize. Zohra Opoku presents her installation combining elements including textile and fashion objects, photography, video and street intervention. Influenced by her Ghanaian-German background, Zohra explores how textiles, fashion cultural trends movebetween Africa and its diaspora. Her work examines how clothes, trends and traditions play a role in shaping the identity of a society. Zohra holds her MA in Fashion from the Hamburg University of Applied Sciences. Her residencies include Art OMI; Ghent, NY; Iwalewa Haus Bayreuth, Germany; and Jan van Eyck Institute, Netherland. She is included in the touring group exhibitions Making Africa curated by Okwui Enwezor. Upcoming exhibitions include the Material Effects at Eli and Edythe Broad Art Museum, Michigan and Designing Futuresat the LagosPhoto Festival 2015. Zohra lives and works in Accra with a support from the Foundation of Contemporary Art Ghana. Experimenting with new techniques available at Kala, Maiko Sugano created Tea Ceremony of Birds combining digital prints with hand-carved wooden objects. Trained as a furniture maker and sculptor, Maiko integrates contemporary artwork with everyday life. Tea ceremony utensils represent sensory craftsmanship, beauty and playfulness outside of the tradition of a tea ceremony. Maiko received her BA and PhD from the School of Fine Arts at Tokyo National University of Fine Arts & Music, and her MFA from California College of the Arts (CCA). She was a recipient of the Excellence Prize in the Parco URBANART #6 competition, the Murphy and Cadogan Fellowship, the Wornick Scholarship from CCA, and Japanese Government Overseas Study Program Artist grant. She currently lives and works in Ibaragi, Japan. Rodrigo Valenzuela investigates the tension between the traditions of documentary and fiction. He explores the way an image is inhabited, and the way that spaces and people are translated into images. His work serves as an expressive and intimate point of contact between the broader realms of subjectivity and political contingency. Rodrigo is a Chilean artist living between Houston and Seattle. He holds a BFA from The University of Chile , a BA from The Evergreen State College and an MFA from the University of Washington. He is currently a Core Fellow at the Museum of Fine Arts in Houston. His work has been shown at MOCA Miami, National Academy Museum in NY, North Dakota Museum of Art, Henry Art Gallery, El Museo Cultural de Santa Fe, and more. During 2015 Rodrigo will have solo shows at the Contemporary Art Museum in Santiago, Chile, The Frye art museum in Seattle WA and UPFOR gallery in Portland, Oregon.